Marketing Fees (non-refundable) - $50 - No Reserve, $100 and $150 - Reserve for available lots. Lot numbers 1-30 reserved for vehicles in excellent or near excellent condition. Click here to register your car in one of our auctions. 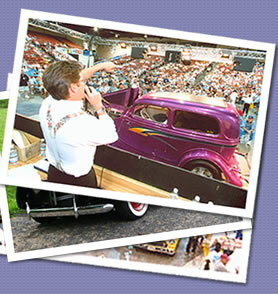 Please call the office today to consign your collector car to one of our auctions. 1-800-255-4485. Office hours are 9am - 5pm PT Monday to Friday. Our knowledgeable staff can assist you in determining current market value for your vehicle as well as sign you up to sell your car at an upcoming auction. We can fax you a list of lot numbers available or you can ask for our recommendations. Marketing fees are paid in advance and the payment guarantees you will have a lot number for the auction. Marketing Fees are non-refundable The commission is determined when the vehicle is sold. If the vehicle does not sell, you will not be charged a commission. You have the choice to sell your vehicle with a Reserve or No-Reserve and you can make that decision during check-in which is usually the day before the auction. We have several appraisers on-site during check-in that can give you an accurate appraisal rather than an estimate which is given over the phone. Many questions you may have may be addressed in the following sellers contract. Please take the time to read and acquaint yourself with our auction process. These terms should be used for reference only. Terms of the consignment contract may differ per auction. 1. At the time of signing this contract I have entered into an agreement to deliver and offer my vehicle for sale at the Silver Collector Car Auction Inc. for the reserve price stated. The reserve price is an expected selling price that is inclusive of the auction commission. The Auction Company reserves the right to lower the commission in order to sell the car with the seller's net figure being unchanged. The seller may verbally agree to lower the reserve price during the auction process. If a vehicle is checked into the auction and does not cross the action block to be offered for sale I agree to pay the sale commission in full plus Buyer's Fee on the stated reserve price unless specific written authorization is obtained from Silver Auctions waiving these fees. "No-reserve" means that the vehicle will sell to the highest bidder regardless of the price. These must be offered as No-Reserve prior to any bids being taken. Owners or owner representative may not bid on own vehicles. "With Reserve" means the owner may place a minimum protective price on the vehicle. Where allowed by state law, auctioneers may bid on behalf of the seller up to the stated reserve. If a vehicle is completely checked into the auction the day prior and does not make the sale day car list a $20 refund may be given to the consignor. For Nevada: Consignors can change their lot number from No Reserve to Reserve upon the payment of double the difference and no discount applied. 3. Marketing fees are non-refundable and do not apply to commission. 4. A buyer's fee of 8% (min. $250)	will be charged to the buyer of each auction lot sold. Silver completes transactions and releases vehicles based on the buyers/bidding contract and its terms. 5. Title: The Auction Company must have title at time of check-in. Exceptions will be considered on an individual basis. Lost title applications or titles-in-transit must be cleared with auction company in advance, and may or may not be accepted. Serial number must match the title and be proper. All vehicles must be able to be legally titled. Final sale confirmation may be delayed until state authorities determine that your vehicle is legal to be titled. 6. In the event of a purchaser's failure to comply with the terms of sale, we will first attempt to resell the vehicle to another buyer for the same price. Failing that, the sale may be null and void. The Auction Company and/or consignor may agree to pursue legal action to complete the sale, this may involve sharing the risk and expense of such action. 7. Insurance coverage must be provided against all perils and loss by consignor including damage caused by another party. Seller shall indemnify and hold harmless Silver Auctions from and against all liability, loss, and damage arising from acts, incident or accident. Seller assumes full responsibility for your own equipment. Insurance responsibility passes to new buyer when the auctioneer declares vehicle sold. Your insurance is the only insurance covering the operation and storage of your vehicle. I agree to allow Silver Auctions and its agents to move my vehicle at my risk. 8. If said vehicle is sold within 60 days to any person as a direct result of the Auction, its advertising or promotion, then I shall agree to pay the commission and the buyer's fee on the stated reserve price. 9. Jurisdiction/Venue-Governing Law. In the event of consignor's default on any terms herein, said Auction Company or assigns shall be entitled to attorney/legal fees incurred in the enforcement of this contract. Guarantor acknowledges that Silver is a Washington Corporation with its principal place of business in Spokane, Washington. THE PARTIES AGREE THAT THIS CONTRACT SHALL BE CONSTRUED UNDER THE SUBSTANTIVE LAWS OF THE STATE OF WASHINGTON, THAT THE STATE COURTS OF WASHINGTON SHALL HAVE EXCLUSIVE JURISDICTION OVER ANY ACTION BROUGHT TO ENFORCE THE TERMS OF THE CONTRACT OR OVER ANY ACTION ARISING OUT OF THE UNDERLYING TRANSACTION(S) WITH SILVER AND VENUE MAY BE HAD IN THE SPOKANE COUNTY SUPERIOR COURT SYSTEM OF THE STATE OF WASHINGTON. 10. Consignor represents and warrants that he/she has the right to consign and sell the herein-described vehicle and that its title documents are free and clear of all liens and claims unless stated otherwise herein. Vehicles that require a lien release are considered Early Pay and are to be charged. The early payment fee is 1% of net proceeds not less than $100.00. Early Payment is sent on the 3rd banking day following the sale. Early payment checks may not be picked up in person. Express delivery is not available. A wire transfer of funds is available for a $25 fee for domestic and $60 fee for international transfers. 11. Vehicles must be accurately described including items working poorly or not working, description, history and mileage. 12. Vehicles Guaranteed by the consignor to have less than 100,000 miles and is sold for more than $3,000.00 are guaranteed for internal engine components, transmission, and power steering. 12A. In event a guaranteed item does not work, the buyer may request arbitration. All requests for arbitration must be filed in writing within 24 hours of buyer completing sale transaction. Your contact information may be passed onto the buyer at their request. Silver Auctions will determine if the request for arbitration is valid and if it is will resolve by repair, price adjustment or sale rejection. 12B. If consignor agrees to repair the problem, the car remains sold. Silver Auctions will control all repairs. 12C. Repairs estimated to be less than $200.00 by Silver Auctions are not guaranteed and are the sole responsibility of the buyer. 13. Sale rejection (for any reason) will make the consignor subject to all auction sale fees. In the event of a dispute, all transactions with Silver collector Car Auctions, Inc. may be combined together towards resolving the dispute. 14. All "Frame Damaged" vehicles, "Salvaged" or "Rebuilt" titles, or any "Insurance Totals", or "Brands" are the consignors responsibility and must be declared in writing on the description sheet prior to the sale. Failure to do so may result in sale rejection. 15. It is your responsibility to drive your own vehicle through the auction system. If you would like us to drive your car for you, please let us know. There is a $10.00 driving fee to be paid in advance. If a drive fee is paid and the vehicle does not cross the block, then your marketing fee and drive fee will be will be refunded. If we drive your car, we are not responsible for any damage or accident that may occur. 16. Payout is made on the eleventh banking day following the sale. A check for the sale price of the vehicle less the appropriate commission is mailed to you and postmarked on the eleventh banking day following the sale. Checks may not be picked up in person. Express delivery is not available. A wire transfer available delivery for a $25.00 fee and $60 fee for international transfers. Wire transfers are sent on the morning following payout. 17. I do hereby authorize SILVER AUCTIONS to act as my ATTORNEY-IN-FACT in signing my name to any and all forms necessary for a transfer of my rights, title and interest in the motor vehicle described below. 18. In Nevada: If a car that has failed smog is purchased by a resident of Clark or Washoe county, the sale is automatically canceled and we will attempt to resell the vehicle for the same net price, otherwise the vehicle will remain a no sale. 19. Legal Relationship between consignor and the high bidder: In the event that the party to any contract(s) concerning said vehicle believes that the terms of a contract have been breeched, then all contract signatures for said vehicle agree, understand and accept that seller and high bidder have entered into a contract with each other and accept that legal action against the offending party is the proper recourse for claims or redress. 20. If any terms, conditions, covenant, agreement or provision of the contract of the application thereof to any circumstance shall, to any extent, be held by a court of competent jurisdiction or by any authorized governmental authority to be invalid, void or unenforceable, the remainder of the contract shall not be affected by such holding, and the remaining terms, conditions, covenants, agreements and provisions hereof shall continue in full force and effect.